The cheapest and easiest way to buy club tickets for NYE parties in Ljubljana! Purchase the tickets or complete your booking as soon as possible before we are fully sold out. 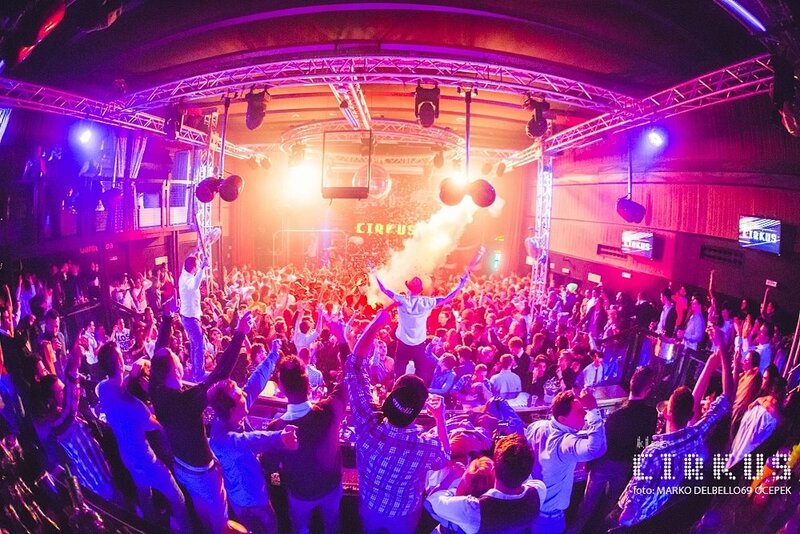 We offer club entry tickets, Pub Crawl Party tickets and VIP & SUPER VIP tables for the best clubs in Ljubljana! Due to high demand, we require a pre-payment to be made via Paypal before we finalize your booking. Photos from our Pub Crawls in Ljubljana. A guided New Year’s nightlife tour where you get party in popular pubs, bars and clubs, while having fun with other fellow party people. Your party guide will take you to the hottest bars, where we will be playing drinking games, completing challenges and meeting new people. At midnight we will scream "Happy New Year", while standing below the fireworks. We will finish the night in one of the best clubs in Ljubljana. Normal package - 5x shots, a glass of champagne, beer for beer pong & beer for beer bong, entrance to Club TOP SIX [worth 25€] & entertainment for the night. VIP package - 5x shots, a glass of champagne, beer for beer pong & beer for beer bong, karaoke, priority VIP entrance for Club TOP SIX [worth 40€] that gives you the access to the exclusive VIP area in the club & entertainment for the night. Photos from the last New Year's Eve and other parties at Club Cirkus. Make a New Year’s Eve just a little extra special by celebrating it in one of the finest nightclubs in the heart of Ljubljana. One of the most colourful nights of the year will enchant you with festivity, fun and positive vibrations Cirkus is famed for throughout the region. VIP table package - VIP entry for up to 5 people, bottle of spirits (1L) with a variety of soft drinks (2L), a complementary bottle of G.H.Mumm champagne, priority entrance service, access to the VIP area & access to the VIP bar. Additional VIP entry fee charge/person applies. SUPER VIP table package - VIP entry for up to 10 people, bottle service & drinks in total value of 1000€ included, a complementary bottle of G.H.Mumm champagne, priority entrance service, access to the VIP area & access to the VIP bar, access to a separate SUPER VIP balcony & a designated hostess service. Additional VIP entry fee charge/person applies. STAGE EXPERIENCE table package - Stage access for up to 15 people, bottle service & drinks in total value of 2000€ included, a complementary bottle of G.H.Mumm champagne & a designated hostess service. Additional VIP entry fee charge/person applies. Photos from the last New Year's Eve party in TOP SIX. Celebrating New Year's Eve 2019 in one of the best clubs in Ljubljana, that offers an amazing view of the Ljubljana castle. Normal entry - entry fee and a complementary glass of champagne at midnight. VIP entry - entry fee and a complementary glass of champagne at midnight, priority entrance, VIP bar, VIP dance & party lounge. Additional VIP entry fee charges apply. VIP table package - complementary bottle of sparkling wine, bottle of spirits (1l) with a variety of soft drinks (2l), priority entrance service, designated hostess service, VIP bar, VIP dance & party lounge and a standing private table. Additional VIP entry fee charge/person applies. SUPER VIP table package - Möet & Chandon champagne, finger food, premium boat of a premium magnum Grey Goose vodka (1l) with a variety of soft drinks (2l), priority entrance service, designated hostess service, VIP bar, VIP dance & party lounge and a high standard private table with a sofa. (only 8 available in the whole club). Additional VIP entry fee charge/person applies.